sleeping shadow. made por Bluelover on FurAffinity.link to his FA page:. Wallpaper and background images in the shadow el erizo club tagged: shadow hedgehog shadow the hedgehog sonic drawing picture. wow! he s so cute when he sleeps! SEGAFAN YOU MADE SHADOW KILL MY BABY!!!!!!!!!!!!!!!!!! !SILVER ILL NEVER FORGET YOU!WWAAAAAAAAAAAAAAAAAAAAAAAAAAAAAAAAAAAA­AAA­AAA­A!!­!!!­!!!­!!!­!!!­!!!­!!!­!!!­!! shadow is so cute!!!!! !i cant get enough at him!!!! Shadow looks so adorable when he sleeps. I will never be able to get enough of me Shady. Shadow:I'm tring to sleep here. Shadow:You want to sleep with me? Me:I didn't know you deep breath in you're sleep. Aww! 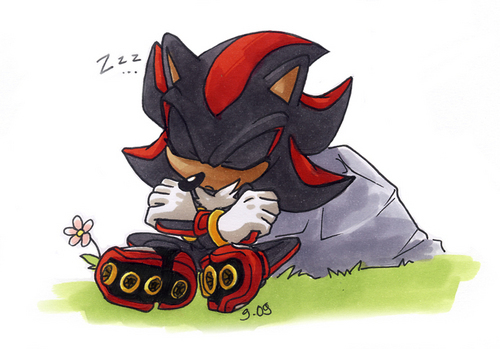 Shadow's so cute when he's sleeping. Me 2! !He does look cool.I thought he was sad,too. Me: heheheh *gets a blowhorn* this will be fun! Sonic: what are u doing? Warning: DONT WAKE SHADOW WITH A BLOW HORN!!!! Warning extra: NEVER LEAVE SONIC WITH SHADOW WHEN U WAKE HIM WITH A BLOWHORN!!!!!! Me:hey ur lucky i dont have a blowhorn! Shadow: WHO DREW ON MY FACE?!?!?!?!?!?! Sonic: WHAT!?!?! I DID NOT!!!! I dunno about ever wanting to sleep anywhere near Sonic or Shadow. But Silver, that is a different story... In a good way. I guess he woke up at 12:00 and couldn't sleep did he?